Michele Boscacci still remembers his first day at Ziano di Fiemme, in 2009. «I got there and was told to ask for Mr. Massimo Dondio. Yes, 'il Macha', but at that time I didn’t even know what this Mr. Macha looked like. He introduces himself and immediately hands me a Stratos ski boot. It is a carbon boot weighing only 650 grams including its inner, the lightest on the market. «For me, still a junior, it was pure gold, the best. To be there and collaborate with La Sportiva and use their boots was like winning the lottery for me. The next day was the night race on Monte Agnello and straightaway I went to try them out. I immediately had a feeling for them which I still have today, and to tell the truth, it never crossed my mind to change, because I have always been really happy with those boots and over the years a special bond has been created with La Sportiva. So much so that in 2016 I started to use their skis and even involved my father, Graziano. And in the end this Mr. Macha has become a real friend». Macha is present at all the races and servicing the athletes has always been part of the philosophy of the company, ever since 1985, when La Sportiva serviced the first climbing competitions in history, Sportroccia at Bardonecchia. «In the ski mountaineering competitions lasting over a period of days the direct assistance of a company and their technician is really something extra - says Michele - for better or worse». Once at the European championships, at Les Marecottes - in 2016 - when Michele got his new boots just the day before the competition the upper cuff seemed too hard and stiff. «It rubs Macha! It rubs too much!». And so Macha spent the whole night filing down and fixing the upper cuff, greasing it with silicon spray to make it softer and more flexible in its movement. In the end Miky Boscacci won that race the next day, the individual European championship. The Boscacci-Dondio duo, have had lots of adventures together. «In a World Cup sprint I have a good qualifying time but during the jump, due to a bash, the spring of a buckle loosens. Then Macha, waiting for me at the end of the run, rushes off with my boot to fix it in his workshop-van: «Hurry up Macha, be quick, they are already calling my name for the heats!». To keep myself warm I kept walking around the van wearing another emergency boot so that I would be ready in case they called my name. Macha stays calm, while I continue to warm myself and get more agitated. In less than ten minutes I am already wearing the boot good as new». The advantage of having the company beside you, always there at the races with a technician and spare parts, is the factor which the athletes appreciate most. They feel protected and in good hands. If something goes wrong, someone is always there (it’s always Macha), with all his equipment, ready for any last minute repairs. «The great thing about La Sportiva is that research and development never stop. At least once a year there is a visit to the company headquarters: you also visit the upper floors to try and get a better contract, but first of all you can’t believe your eyes passing by the production area and the Innovation Center. There is always something new, a machine, a project a prototype. This year the new autoclave has arrived which makes the shell and the cuff of the boots Stratos Hi-Cube. 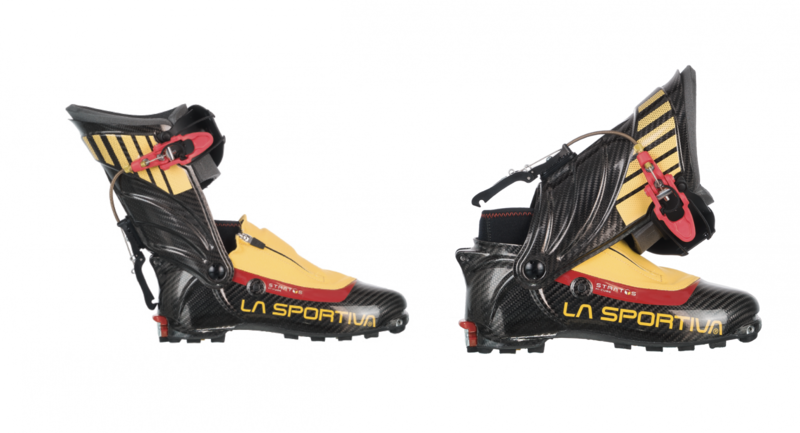 At La Sportiva they never stop and rest on their laurels because of a winning boot, there is always something new brewing and they involve you in what they are doing. And then above all: they listen to what you have to say». The development and perfection of products are two separate moments. After gathering feedbacks from athletes, opinion leaders, product managers and the team of testers, the boot is planned and designed. The first prototypes take shape. Then they proceed to develop and perfect the boot. Then the tests. Finally, the product is ready to be tested by the top competing athletes before any final adjustments and last touches are made. «Wearing the next year’s model - continues Miky - is always a great feeling: I am not a tester, but at the preview of the Hi-Cube there was a buckle instead of Velcro. I said I preferred Velcro and they made me a special version with Velcro. Above all it is feedback which they take into consideration also for production as well as for other boots». 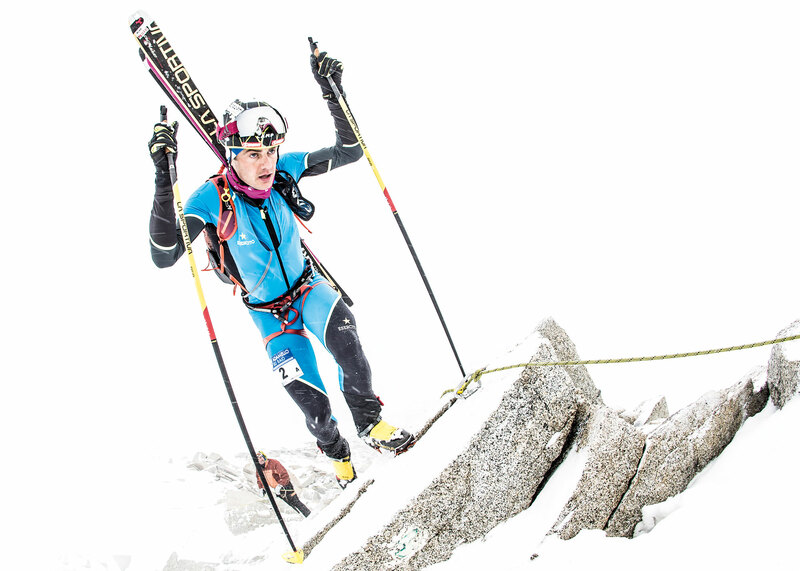 But how many pairs of boots does the winner of the Ski-mountaineering World Cup actually need? «Every year I mainly use two pairs. I request size 27 even if I am size 44. One is usually for training and as an extra pair, the other one is for competitions. But it is almost a superstition for me: carbon does not take on a shape or lose its characteristics, in the end they are so well made that they are practically identical, then you get attached more and more to the ones you won a competition with, compared to those you used for training. You carry on using the competition boots all season and would like to use them for the next season too, but half way through the next year’s boots arrive. Every athlete has his/her own particular preferences, fixed ideas and carries on with those». «The boots never go back to Ziano di Fiemme during the season. If any modification or upgrade is required the work is carried out before the competition on the boots the athlete is using. This is because they are so attached to their model of boot and also because it is a good way of verifying the maintenance of quality over time and to show to other athletes and potential customers, the quality of the product. The boots only return to the company at the end of the season, to be analysed after a period of use under maximum pressure». Not every pair though. «I wanted to keep the boots I used at the Mezzalama in 2017 and didn’t hand them back because there was a story behind them» - says Michele Boscacci. «I had told Macha that the screw in the upper cuff was at its limit, a bit too short. When it arrived for use in my competition boots it still seemed too short to me. I could have throttled him. «You need to change them - I insisted - even if the race was just about to start. No sooner said than done, screws changed by Macha at the last minute and boots ready, probably they would have held just the same but I was calmer that way. We won. I put a sign on those boots with a marker pen and put them aside as a souvenir. I look after them like a relic and consider them as new, because in case of emergency …. you never know. If needed, they’re there ready for use».